Let’s be honest. I am a Disney girl at heart, but I love Harry Potter. 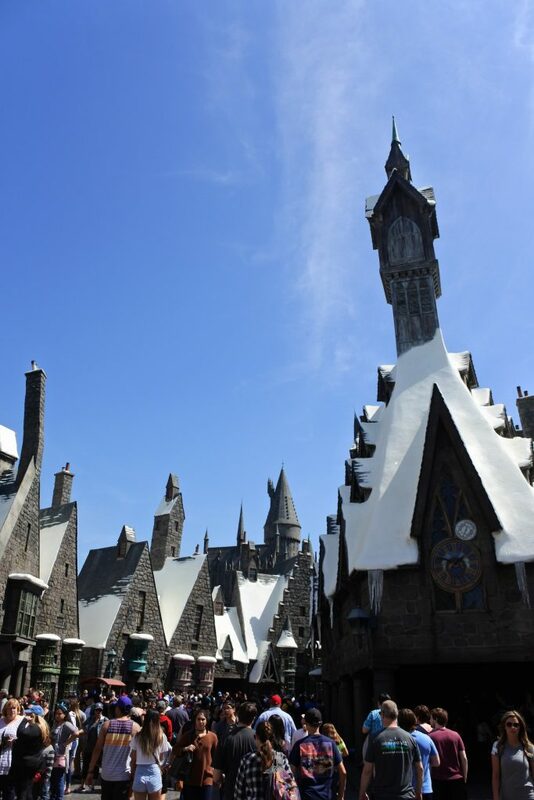 I had no desire to go to Universal Studios Hollywood until The Wizarding World of Harry Potter opened. Once that happened Universal got bumped to the top of my list for our California trip. Was it all that I was hoping? The short answer is “Yes!”, but let me tell you more about our experience. If you are looking for The Wizarding World of Harry Potter at Universal Orlando try here instead. I am not alone in feeling that The Wizarding World of Harry Potter is the real reason to make the trip to Universal and it shows. Although it was spring break the crowd levels felt very manageable around the rest of the park (unlike our days at Disneyland). Inside Hogsmeade and Hogwarts it felt much busier. 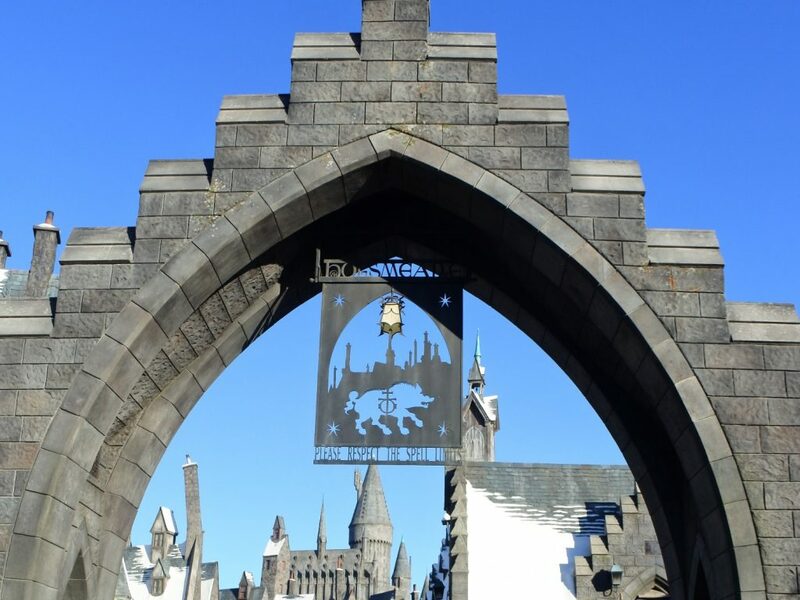 In this article I will provide an overview of all of the rides, shops, places to eat and the entertainment available in The Wizarding World of Harry Potter. This guide will also walk you through the confusing bag lockers that must be used on the Forbidden Journey ride. 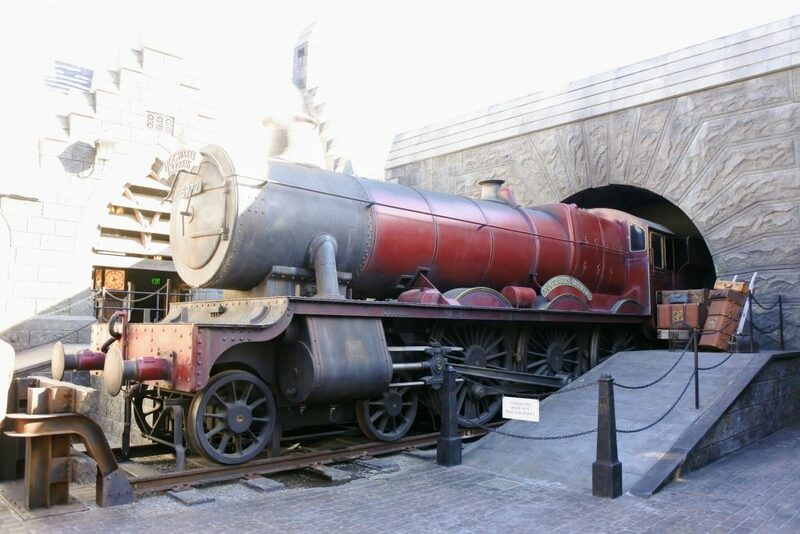 Once you enter under the gates into Hogsmeade you will find a mock Hogwarts Express to the right hand side. It is stationary unlike the one at Universal Studios in Orlando, but you may take pictures of it with a conductor. Pictures may also be taken in a mock train cabin for a fee. This paid photo opportunity can be found inside a building nearby the Hogwarts Express. This ride is a short, mild roller coaster that I felt was similar to Barnstormer at Magic Kingdom. It was fun, but I would not spend more than about 30 minutes waiting since the duration of the ride is very short. It was fun to see Hagrid’s hut and motorcycle with side car in the queue. Height Requirement: 48 inches or taller. This was our first stop of the day (at 10 am thanks to worse than usual LA traffic) and the posted wait time was 60 minutes. We hopped in the regular line (we were saving our Front of the Line use for later in the day) and first encountered the bag check lockers. What are the bag check lockers you ask? Let me tell you so you are not ill-prepared like I was. When you first enter the Hogwarts Castle you are directed to your right side to an area full of lockers if you have a bag. Bags and bulky items like purses are not allowed on the ride. The room was crowded and staff didn’t really explain what was going on, so it felt very chaotic. Pick a set of lockers (there were several banks of lockers to choose from). Find the touchscreen located in the middle of the bank of lockers (only one screen per set of lockers). Follow the prompts to request a locker to store your bag. You will need to place your finger on a fingerprint reader to be assigned a locker. Once your fingerprint is recorded a locker is assigned to you and the button on the locker will light up green to help you find it. Place your items inside the locker, close the door, and push the green button to lock it. Ride Harry Potter and the Forbidden Journey. The exit of the ride drops you in Filch’s Emporium of Confiscated Goods and the door back to the lockers will be on your right side. Find the set of lockers you used. Follow the prompts on the touchscreen and use your same fingerprint to unlock your assigned locker. Get your stuff and go! My park bag that I have used on countless Disney trips barely fit inside the locker because the back is slightly stiff padding. I nearly freaked out. However, I was determined to make it work and was able to coax the bag inside the locker (twice). I would recommend that you bring a backpack or bag that has some flexibility (and is maybe somewhat smaller) to increase the chances it will fit inside the locker without you panicking like I did. The queue: The waiting area for Harry Potter and the Forbidden Journey was very immersive. 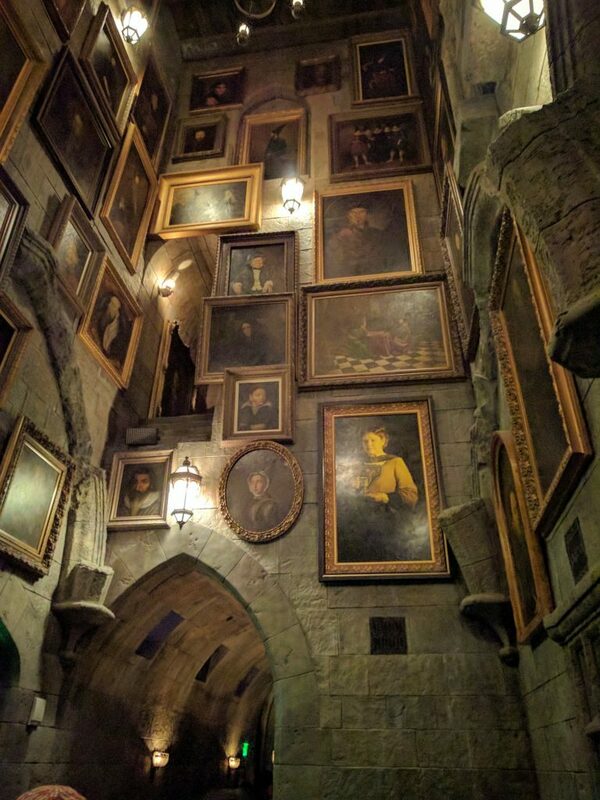 First you wind your way through the greenhouse, then enter the castle where you make your way through the halls of Hogwarts including a hall of talking portraits (so cool! 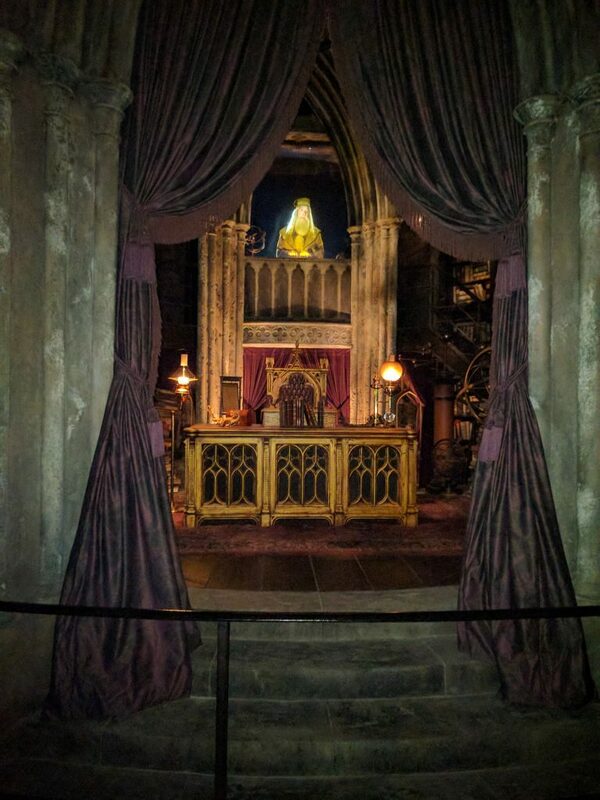 ), the Defense Against the Dark Arts classroom (with a brief appearance by Harry, Ron and Hermione) and Dumbledore’s office before passing the sorting hat to board the ride. We lucked out and the wait was only 40 minutes (instead of the posted 60 minutes). And we were so entranced by the queue through Hogwarts it felt even faster. The ride: You are seated on a set of 4 side-by-side seats perched on a hydraulic arm. The harness is one that comes down over your head and locks your upper body into place. Hermione sprinkles you with Floo Powder and you are whisked away to meet up with Ron and Harry riding their broomsticks in the Observatory. The journey brings you through the Quidditch field, around the castle, past Aragog, a Basilisk, the Whomping Willow and several animatronic Dementors before you are greeted as a hero by students and staff back inside the castle. I thought I had prepared Elizabeth (and myself) for the Dementors, but I failed. I think since they were large, in your face and animatronic instead of on the screen it was spookier than I expected. Please make sure you prepare your children (and yourself) better than I did! Is your wizard or witch in need of a wand? Then Ollivander’s is the place. Here you have the option to enjoy an interactive experience of someone getting fitted for a wand or you may skip straight to shopping. We wanted to see what it was all about and we opted to wait in line to see the fitting. Our wait time was 25 minutes which wasn’t bad. However, I did see the time climb as high as 45 minutes which I would not recommend. 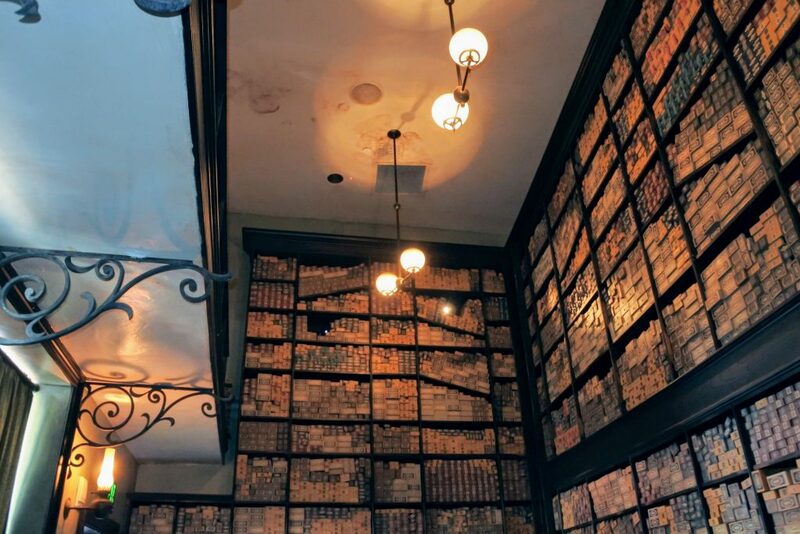 Once you are allowed into Ollivander’s you are ushered into a room packed floor to ceiling with wand boxes. After another brief wait you are welcomed into another room of the shop where you meet the clerk. The clerk chooses someone to have a wand fitting. Our clerk was super dramatic and made it feel like a very serious affair. I won’t spoil the experience for you, but even though I did not want to watch a fitting I had a really fun time. I was so glad my family made me do it! After the fitting is over you are then allowed into the main store where you may choose your wand. The store was mobbed and it was difficult to move around to explore the wand options. There are replica wands of characters from the books in addition to wands that are not tied to characters. There are two types of each wand: one that is merely a replica or one that works magic in the windows of shops in Hogsmeade. We opted for the interactive wand. The wand came with a map of the shop windows where you can perform magic and the instructions on how to perform the spell. We had a lot of fun with the wand in Hogsmeade. 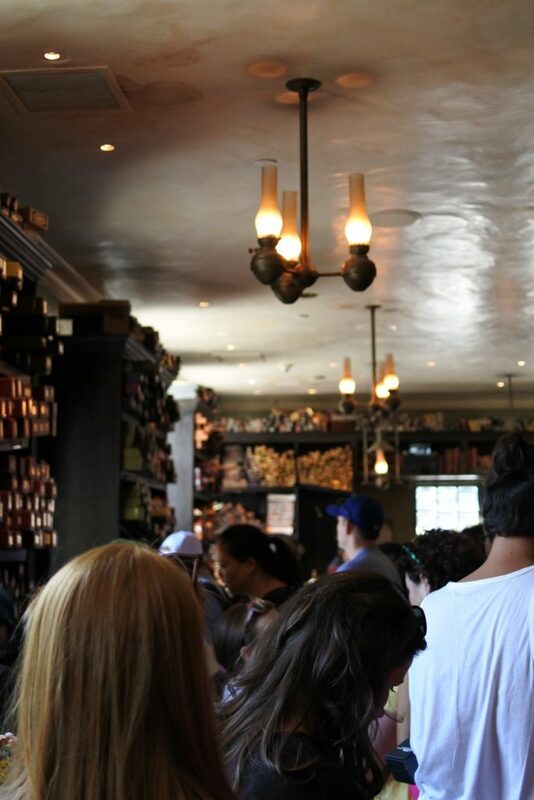 If you don’t want to wait to see the wand fitting you may enter Ollivander’s via a side door directly to the shop or purchase a character replica wand from a stand located in the streets of Hogsmeade near Ollivander’s. 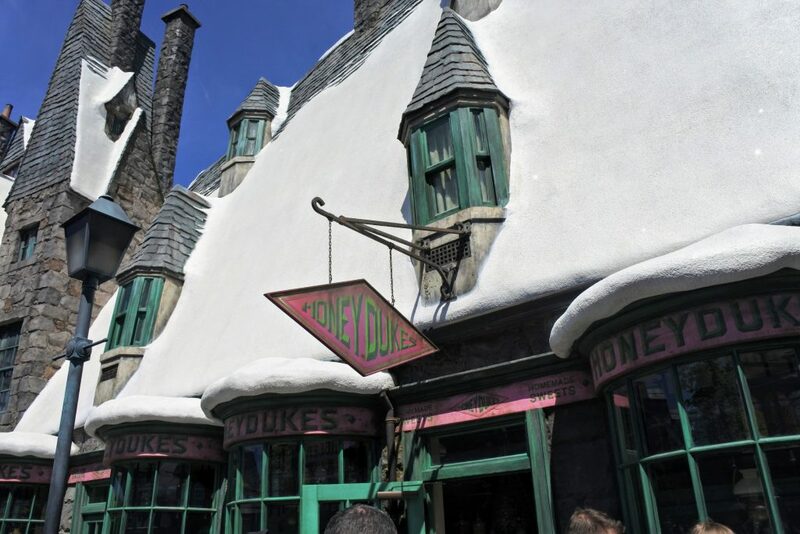 You can send a letter from inside this shop and it will have a Hogsmeade postmark. You will also find stationery and plush owls for purchase. House robes and gear are found here. Elizabeth got a rhinestoned Hogwarts crest pin in this shop. Apparel, house items and miscellaneous gifts. Apparel, movie prop replicas, and more. A wider selection of wizard “equipment” for sale in addition to house robes. Here you can find sweets popularized by the Harry Potter series such as Chocolate Frogs and Bertie’s Every Flavour Beans. This restaurant operates like a quick service meal. You wait, peruse a menu and then order at a cash register. Once your order is placed you are directed to a numbered window where your name will be called and your food provided on a tray. Now that you have your food you may find any available table to eat your meal. I was pleasantly surprised at the quality of the food at Three Broomsticks. We had fish and chips, roasted chicken and Elizabeth had a chicken quarter with wedge fries. 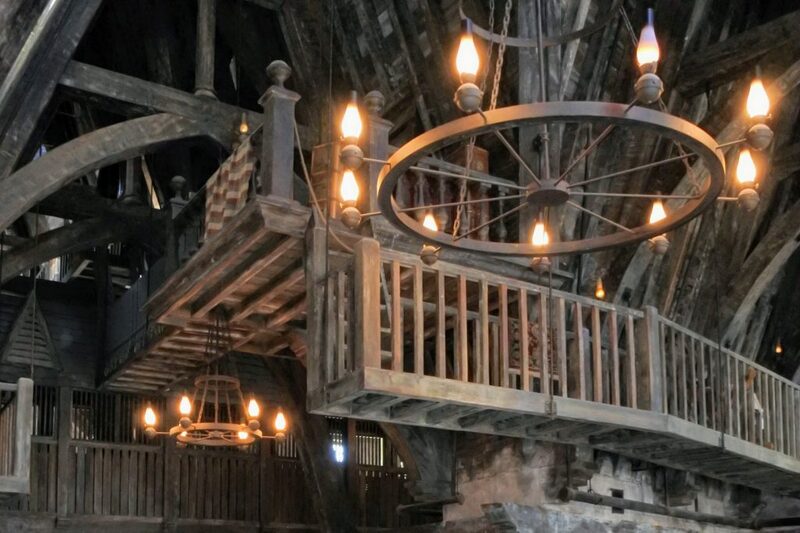 Attached to the seating area of Three Broomsticks is Hog’s Head Pub. 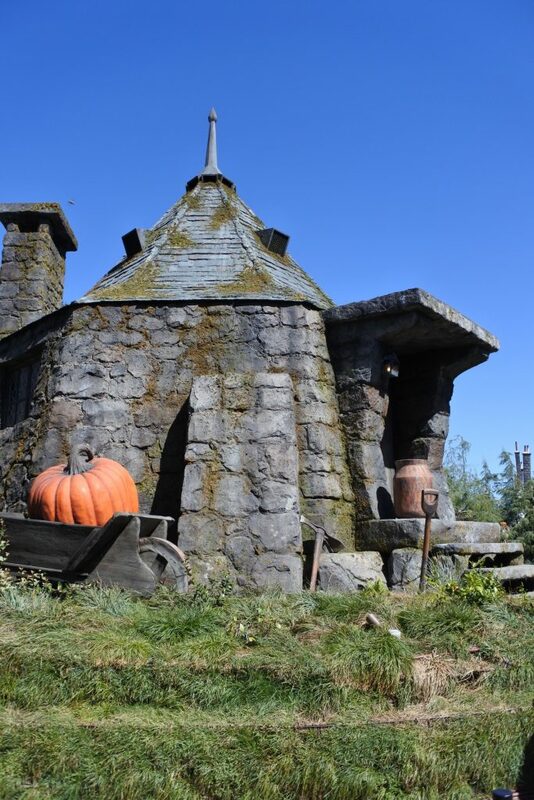 Here you may purchase Butterbeer and Pumpkin Juice for everyone or alcoholic beverages for the grown-ups. These carts are located on the streets of Hogsmeade to provide drinks and small snacks if you are not looking for a meal at Three Broomsticks. 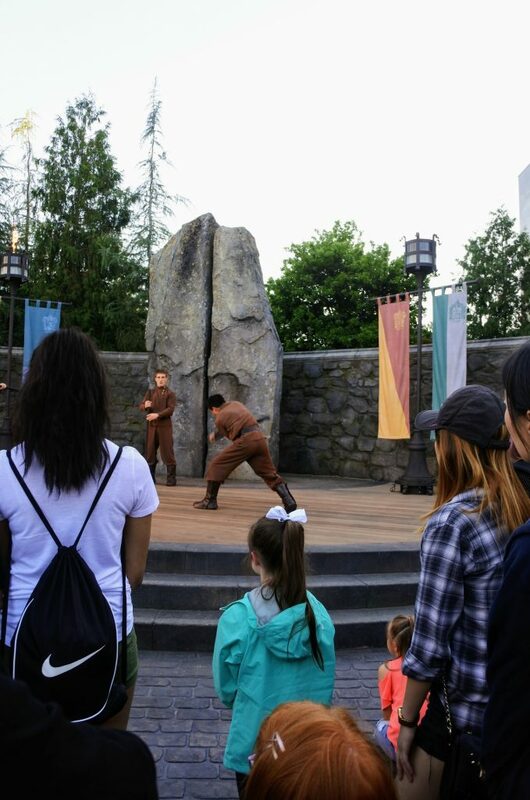 Triwizard teams are introduced and perform some acrobatic/dance moves on a stage. There is an opportunity to meet with the performers after the show. Croaking frogs sing some musical selections with the help of Hogwarts students on the same stage (but different times) as the Triwizard Spirit Rally. So I know this is a little strange to include in entertainment, but even the restrooms carried on the themeing. Moaning Myrtle and rattling pipes could be heard in both the men and women’s bathrooms. As a Harry Potter fan I loved everything about this area. We spent 4 hours straight in The Wizarding World of Harry Potter, left to see other attractions at Universal and then returned to The Wizarding World for almost another 2 hours. Harry Potter and the Forbidden Journey was a fun ride with a mix of screens, animatronics and a hydraulic arm system for the seats that made it a more exciting ride. Even the queue was beautifully themed. Our Three Broomsticks meal was a pleasant surprise. The food quality and portions we had were great. Ollivander’s wand fitting and using the interactive wand around Hogsmeade was an awesome way to feel connected to the Harry Potter story. 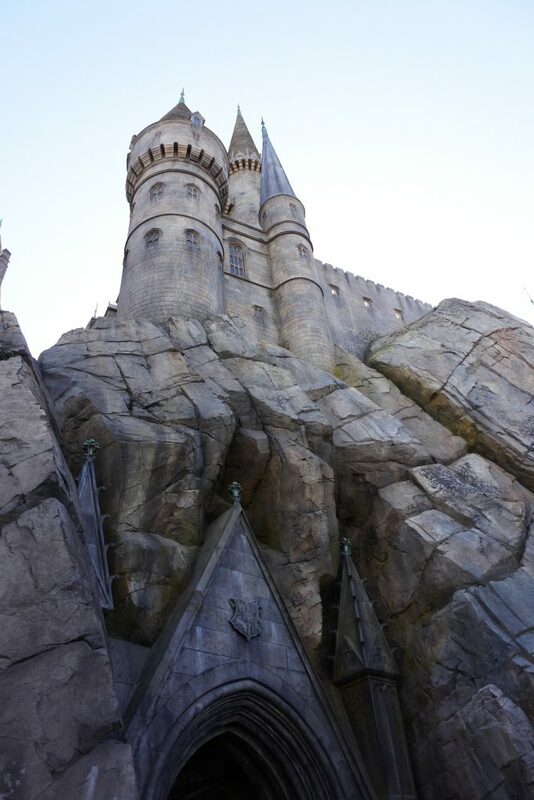 If you are a fan of Harry Potter I would highly recommend you take a day and visit Universal Studios Hollywood – it was just as fun as I had imagined! I have only been to the Wizarding World in Orlando. The Forbidden Journey introduced me to motion sickness like I have never known before. If you have the stomach for it, the ride is very impressive. The line through the castle makes it worth waiting with the rest of your group, even if you have to let them finish the Journey without you. Thanks for sharing all your adventures. Mike, I can absolutely see how motion sickness could be a problem on the Forbidden Journey. I must admit my second time riding left me off-kilter for a bit. Thank you for your input and kind words! Yes, you can walk through the queue, but then exit without riding the ride. This looks amazing! I absolutely cant wait to do this some day. Thanks for all of the great tips! I love Harry Potter so would really love to visit any of the Harry Potter worlds! 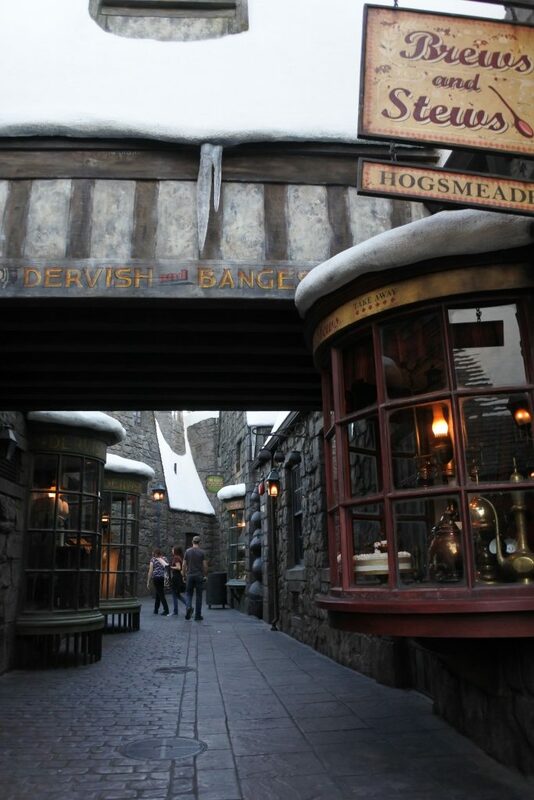 I want to try butter beer and walk around in Hogsmeade! Katie, I have heard the studio tour is awesome. I am adding it to my UK bucket list! I am dying to go here! It looks like you had so much fun. I am a big Harry Potter fan and this is on my bucket list! I’m pinning this for my cali trip! We need to read some Harry Potter before we go! I love how the wands work in various places all over the Harry Potter land. So fun. However, I am really interested in trying the butter beer. I tried the frozen version and it was delicious (but very sweet)!The flavor was kind of butterscotch with a hint of marshmallow. Has anyone had the Butter beer or pumpkin juice? Is the one a soda and the other an actual juice? I have checked out recipes on line that make the butter bear look suspicious. My son is IgE > for wheat/barley/rye & peanut. He also has very high numbers for all nuts, dairy, egg and sesame. I don’t want to have a heartbreak situation at the the Butter beer bar. Ironic that I’m even considering giving them what is probably soda for the first time in their lives but he is turning six and he has never eaten in a restaurant. I want him to have an experience. You understand. 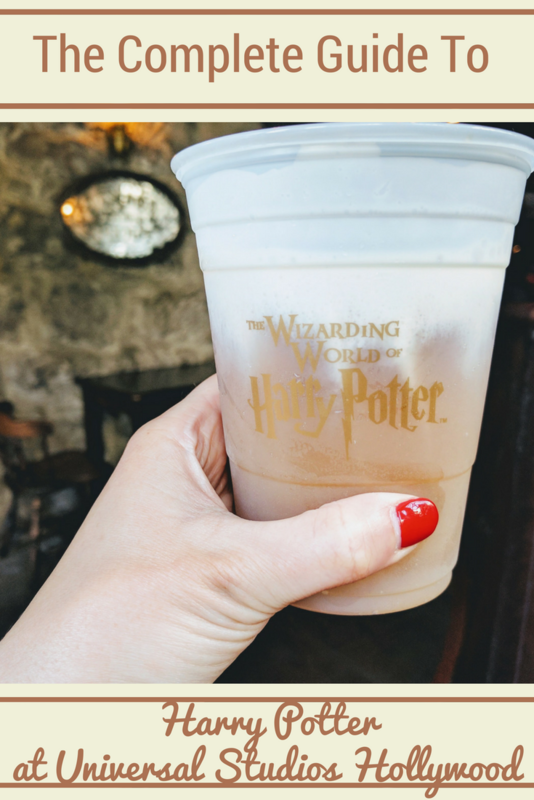 Butterbeer is a sweet, but uncarbonated drink. I have not tried the pumpkin juice. Universal in Hollywood was not easy to work with for food allergies during our visit (as opposed to Disneyland and Disney World which are amazing). If it were me, I would prep him that it is unlikely to be an okay drink, but ask for a manager (inside 3 Broomsticks) and see if they can provide an ingredient list to you. Can anyone tell me if the Harry Potter rides are disabled friendly? I’ll be in a wheelchair but can get on rides still. Awesome post 🙂 I’ve been to the Universal Studios in Orlando and love the fact that the lockers for the rides are free (I think for up to one or two hours). Just wondering if it’s the same in Universal Studios Hollywood? Thank you Danielle! Yes, the locker systems are identical at Universal Hollywood and Universal Orlando Wizarding World of Harry Potter. The lockers are supposed to be free while you ride. My understanding is actual free time for the locker will depend on line wait time and ride duration.